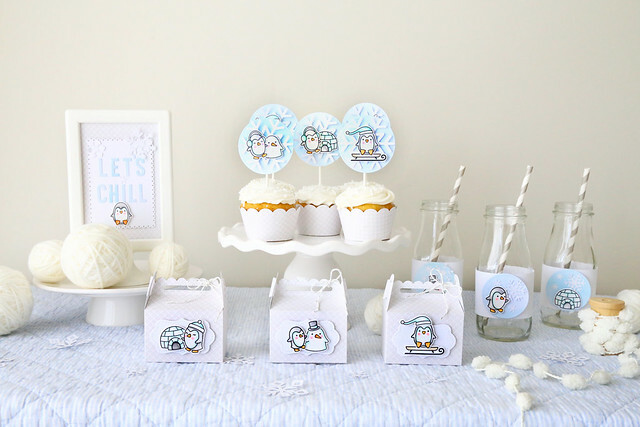 I'm here and on the Lawn Fawn blog this morning with a simple but very cute penguin party! The subtle colors made it hard to photograph but it all looks so pretty in real life! I set everything up while my kids were at school, and tore it down before they came home. 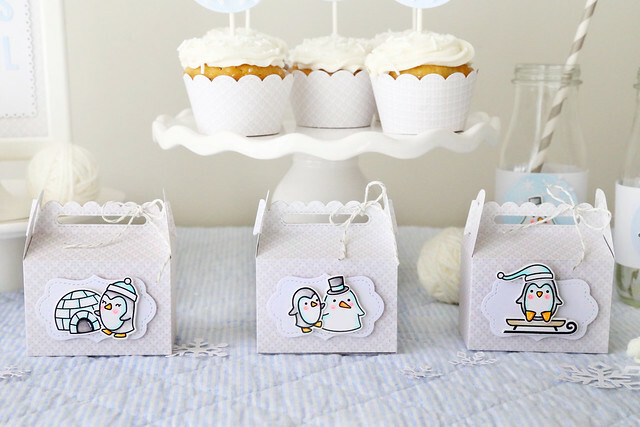 The decor is tucked away and the cupcakes are in the freezer, waiting for the elf to suggest a little North Pole party one December evening. 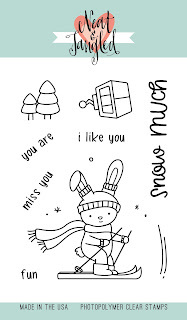 I combined images from Snow Cool and Toboggan Together to create all of the decor. I kept the colors icy: cool blues and subtle light greys. I cut the letters out of blue watercolor paper, which looks a little icy! The letters are not a uniform blue, which adds to the wintery theme. I used the same watercolor paper to cut out the circles for the drink bottles. I can't wait to surprise the kids with everything very soon! Check out the Lawn Fawn blog this morning for a few extra pictures and more detail on products used - click! 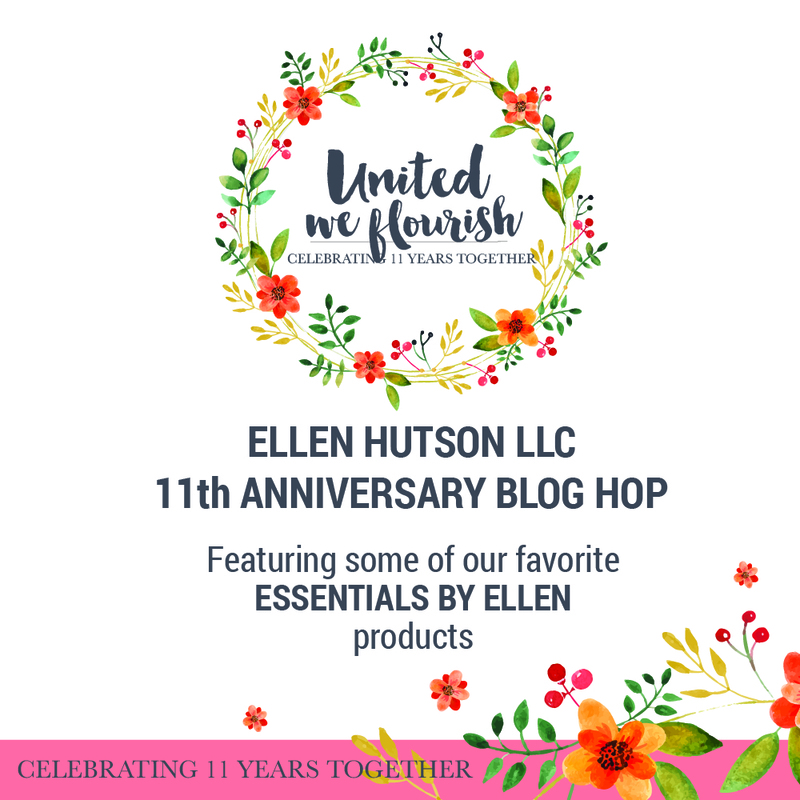 If you're following the hop, you should have arrived from my friend Miriam's blog. If you're just popping in here, you can check out the full list on the EH blog - click! 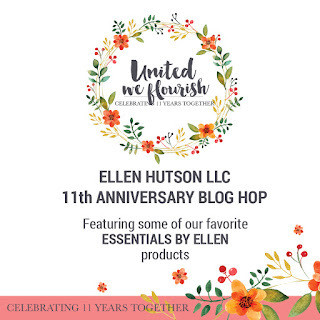 For this hop, we are all featuring our favorite Essentials By Ellen stamp sets. I am using Tree Farm, with a little help from Light Parade. 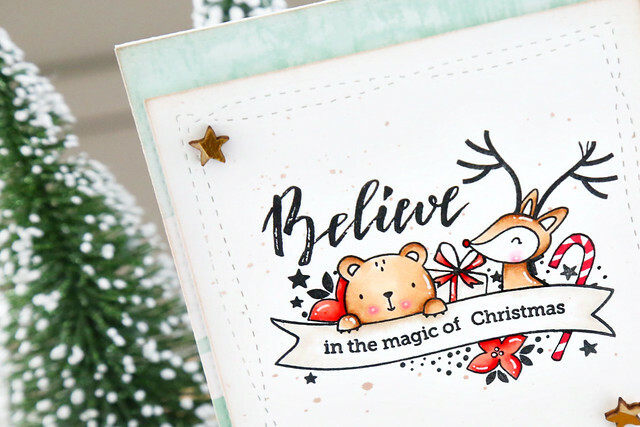 I started out by stamping and coloring all of the images - truth be told, I colored more than I ended up needing, but that is my favorite part of card-making! 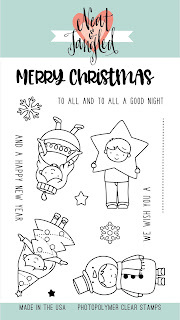 I gave the extra images to my little girl, who made a card for her teacher. 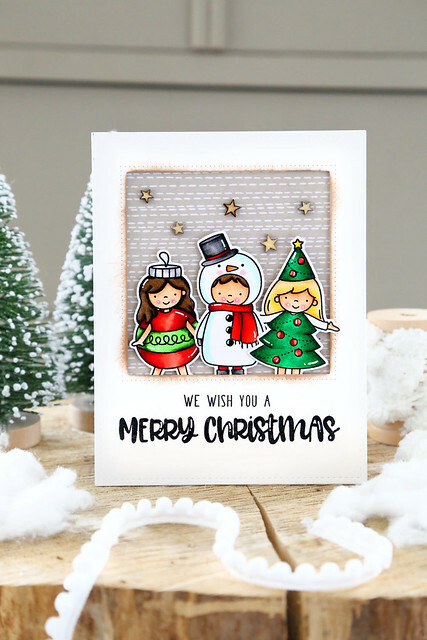 I wanted the images to look seamless - without the distraction of the white border around the smaller die-cut elements like the hat and scarf - so I used a black copic-friendly pen to re-draw the missing lines and colored everything in. It didn't matter so much for images in the background, but for the hedgehog and mouse, it helped everything come together a little better. I love that sentiment, it always makes me smile! I decided to stamp a few music notes into the hedgehog's sign, to reinforce the theme. 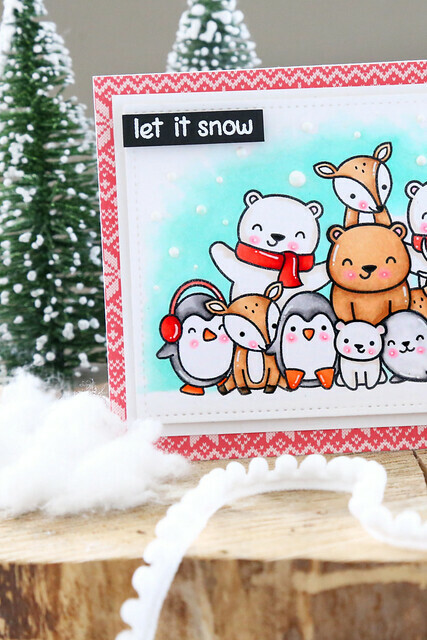 To make everything pop, I used a white gel pen to add highlights and painted snow onto the trees with white nuvo drops. I hope you like it! 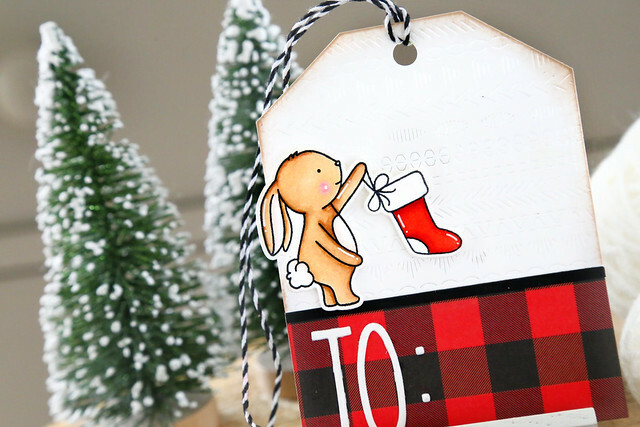 Your next stop on the hop is Wanda's blog - click! Be sure to check out the hop all week long! 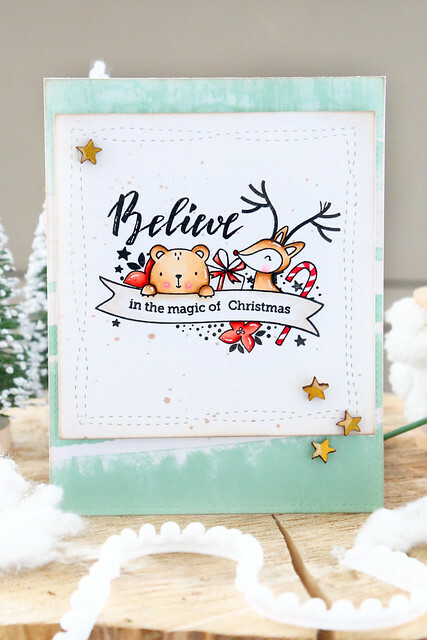 I'm here and on the NT blog this morning with another Christmas Pageant card. These little kids are so fun to color! The card is pretty straightforward, but I like that it came together so quickly. 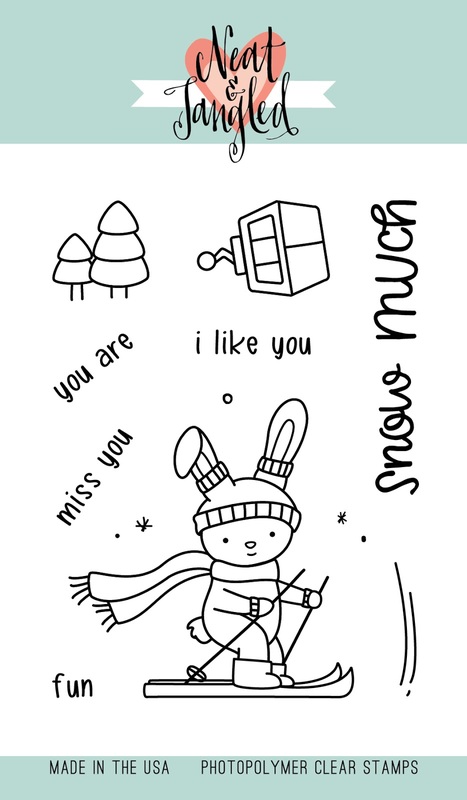 The fun part of card-making for me isn't in coming up with a fancy card design, it's the coloring. 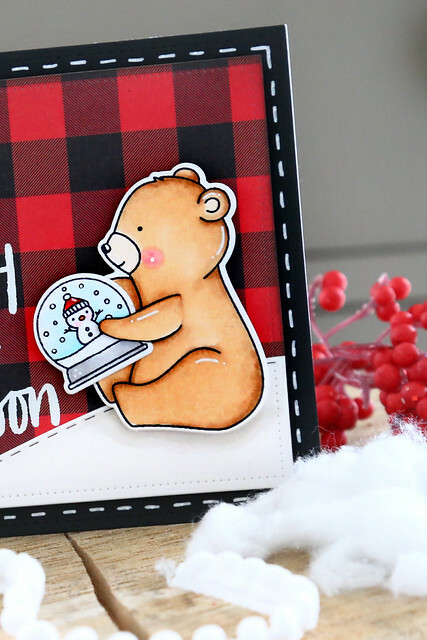 I colored my 3 favorites in a classic red-green holiday combo and created a frame for them to sit inside. The sentiment fills in the space at the bottom so well. I love a larger-scale sentiment! 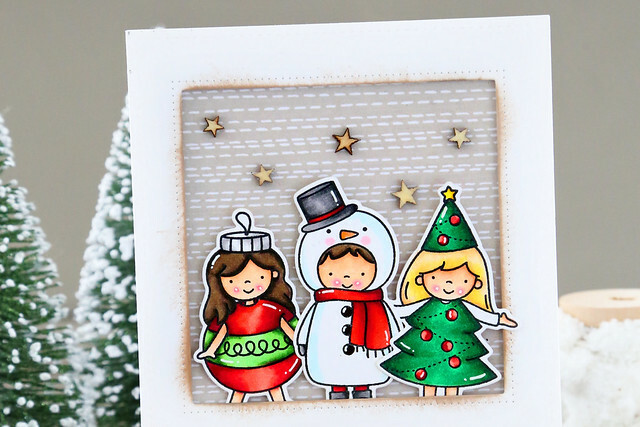 The little Christmas tree girl looks like she has an arm around the snowman. so cute! I hope you like it and thanks for stopping by! 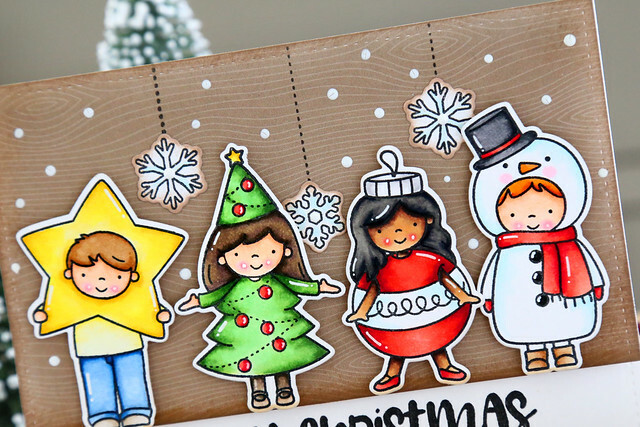 This week is Fawny holiday week over on the Lawn Fawn blog! 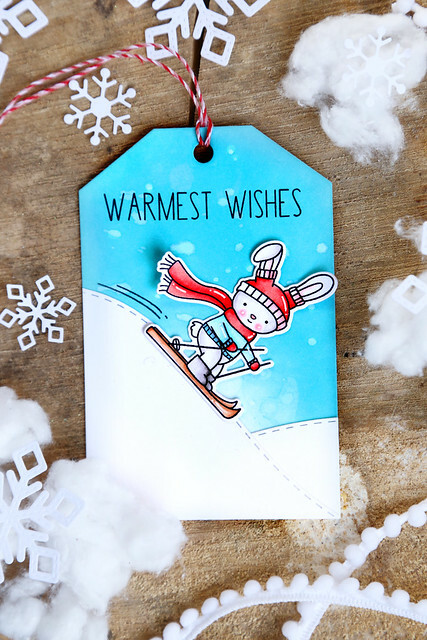 Get ready for tons of Christmas card inspiration. So many smiling critters! I love how I could pull them from a bunch of different Lawn Fawn sets and still have them work so well together. 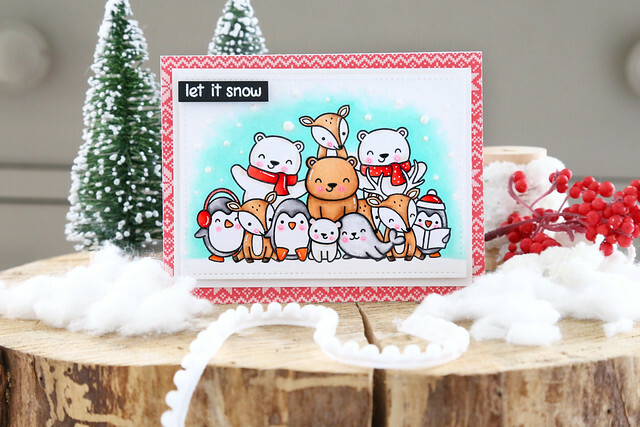 I used bears from Beary Happy Holidays, deer, penguin and seals from Here We Go A-Waddling, Toboggan Together, and Sealed With A Kiss. 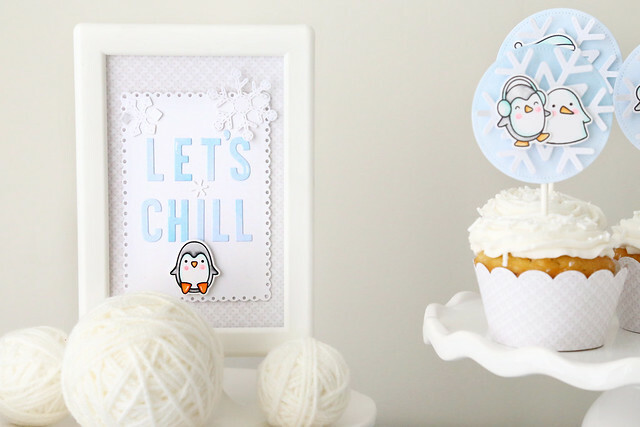 I framed the fun scene with a piece of Knit Picky Paper. 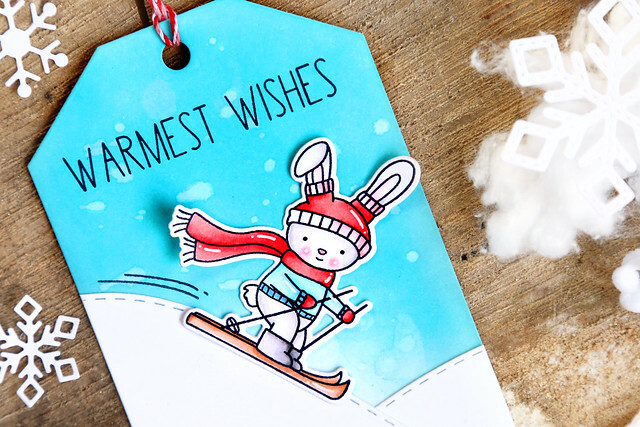 It was so fun to sit down and create this card. I haven't done this much masking in a long while! 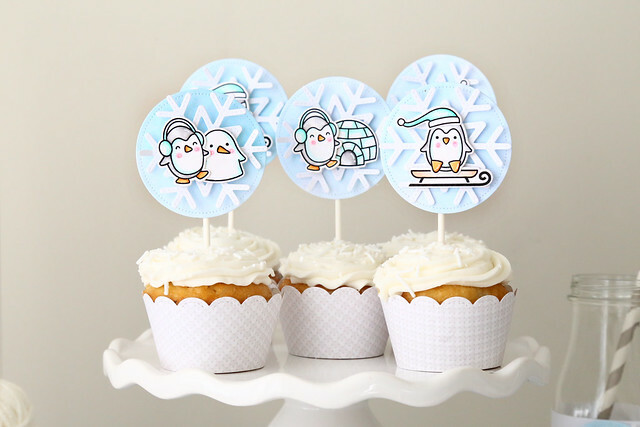 Hi there, and welcome to Avery Elle's Winter release blog hop! It is a beautiful scripty alphabet set, and so forgiving to use if you aren't a precise stamper (pointing to myself.) Wherever I had a line that just missed connecting with the next letter, I used a black copic multiliner pen to draw it in and it looks perfect. I went to my friend JJ's house in October and spent a few days coloring images and eating gummy bears (too many gummy bears.) 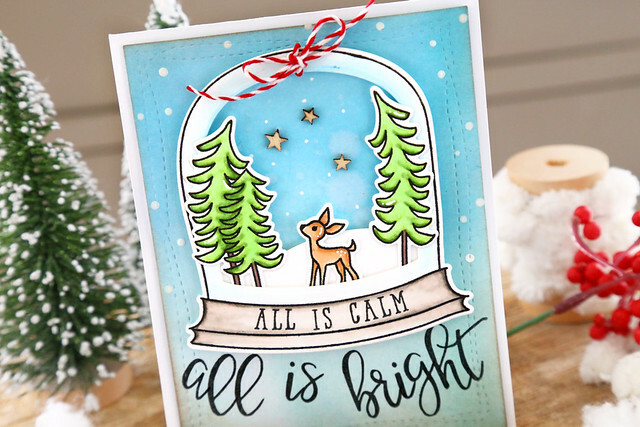 This snowglobe was one of them - it is so gorgeous! There isn't any picture more serene in my mind than a lonely deer looking up at the stars, standing on a blanket of fresh snow. Since I don't own the Snow Globe set, and I only had what I brought home, I had exactly one shot to stamp the first part of my custom sentiment. Thank goodness that I didn't botch it. I really love using Elle's Alphas. 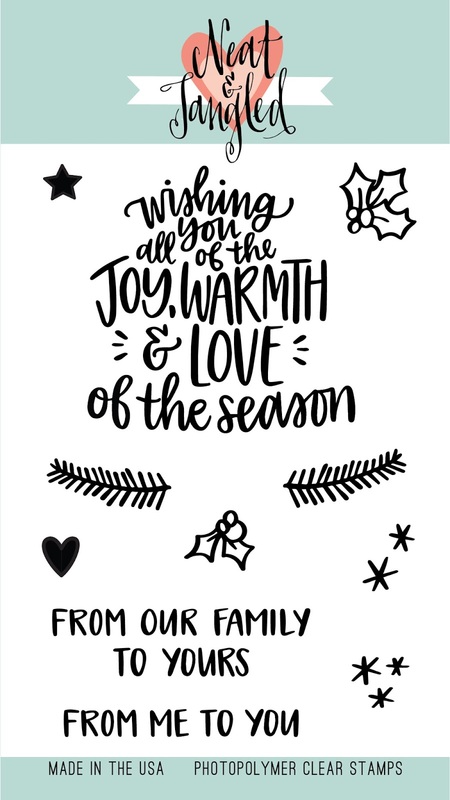 I used them on place cards for last year's Christmas dinner and they never disappoint. I inked up the background with different blues and then dusted the edges with a soft brown ink, applying a heavier hand at the bottom. 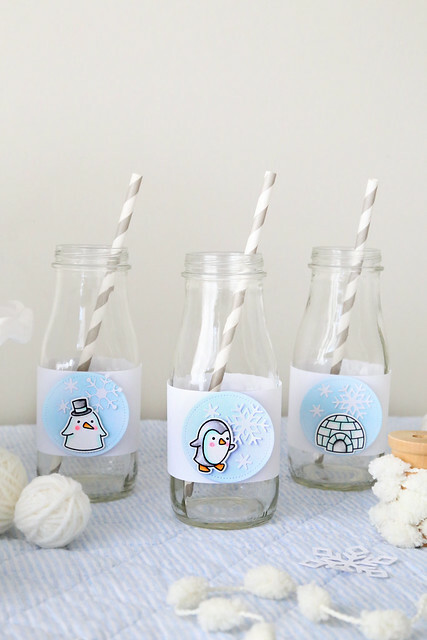 The script letters were stamped to curve around the base of the snowglobe. 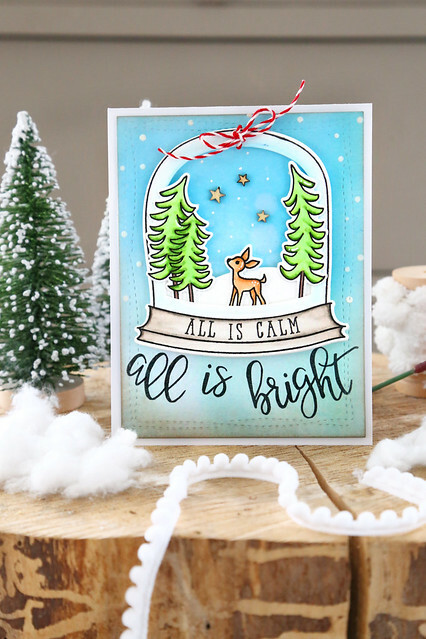 I love how the trees in the snowglobe are also curved - it adds so much whimsy to the image! 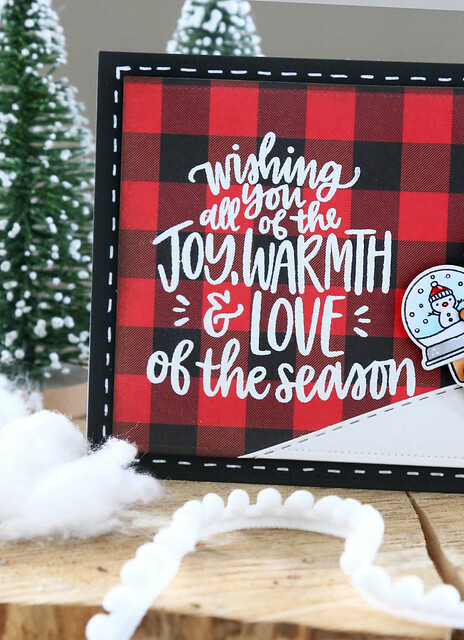 To celebrate our Winter 2017 Release Blog Hop, Avery Elle is giving away a $25 Gift Certificate to one random winner. To enter to win just comment on this post. There is no purchase necessary and you must be 18 years of age or older to enter. This giveaway is void where prohibited. You can also do options 2, 3, 4, 5 or all 6 of the following to increase your chances of winning. You have until midnight Sunday, August 13th to enter. 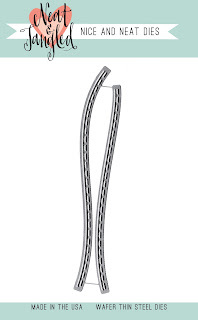 The winner will be announced on the Avery Elle Blog on Monday, August 14th . All products are available for purchase in the Avery Elle store right now. Welcome to Neat and Tangled's November release week. All of the products that we feature throughout the week will hit the store on Friday morning! 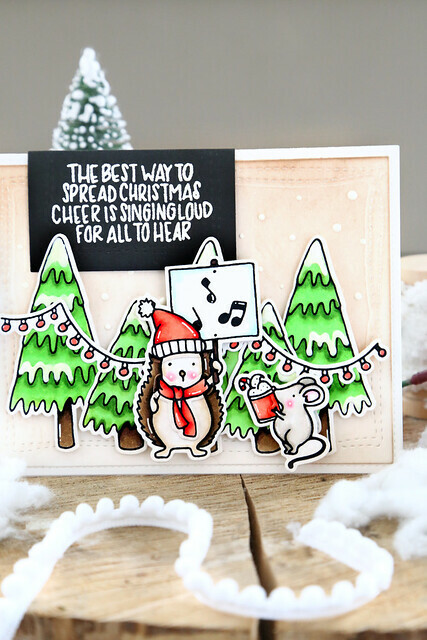 Today, we're showing off another hand-lettered set, this one designed by Miriam. 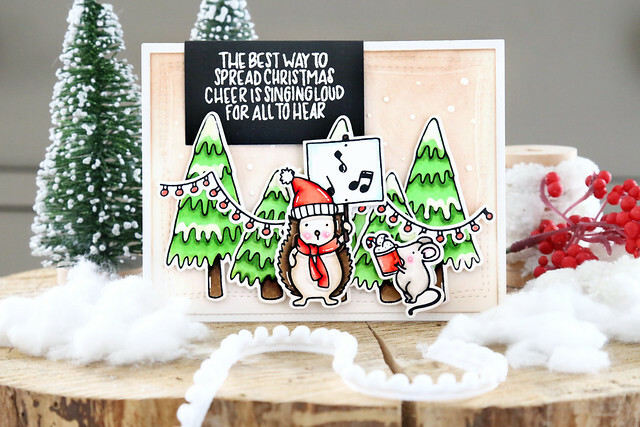 Joyful sentiments will have you singing while you stamp! 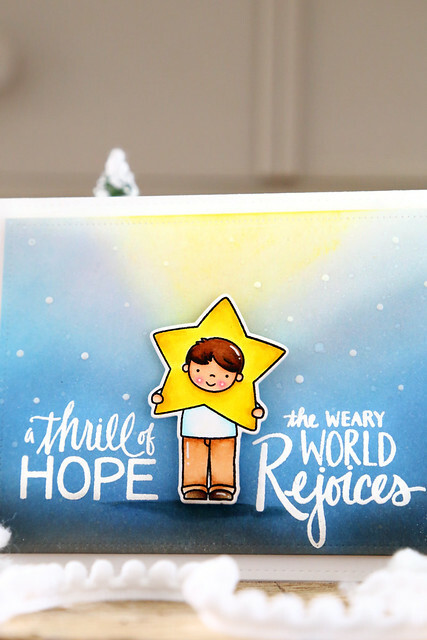 I used the little boy from Christmas Pageant and did some ink blending in blues and yellow to highlight the star. Using Distress Inks I started at the bottom, with Black Soot, working up to Faded Jeans, Peacock Feathers, and into Tumbled Glass. For the yellow I used Squeezed Lemonade. I wanted the sentiment to sit on either side of the focal image, so I carefully snipped it apart and heat embossed both parts. I used a dark blue copic marker to give the boy a little shadow underfoot and popped him up using foam adhesive. To finish off, I dotted the background with a white gel pen and mounted the panel onto a folded white card. 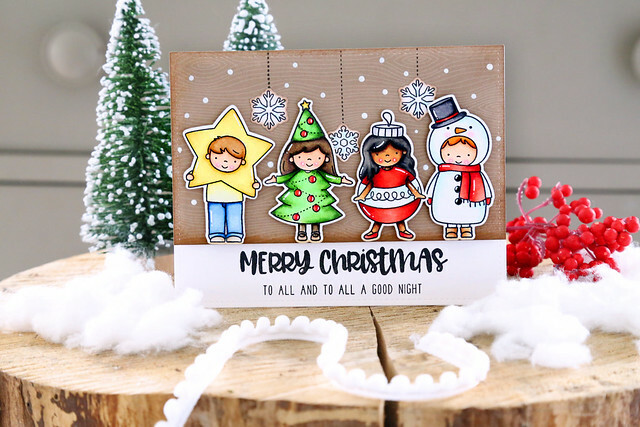 Today, we're all showing off my latest 4x6 stamp set, Christmas Pageant. 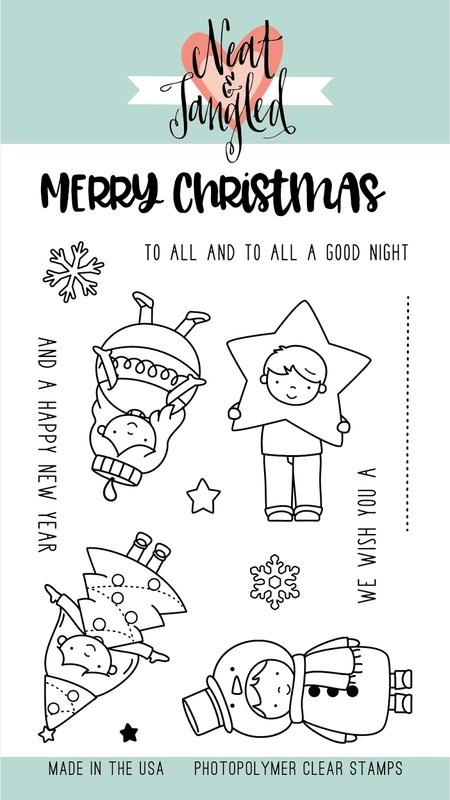 It features 4 cute kids in costume, snowflakes and stars that you can hang from the auditorium ceiling, and a few fun sentiments. Can I have a favorite? The red-headed snowman kills me. I colored all of them, and set them onto a wood-grained background. 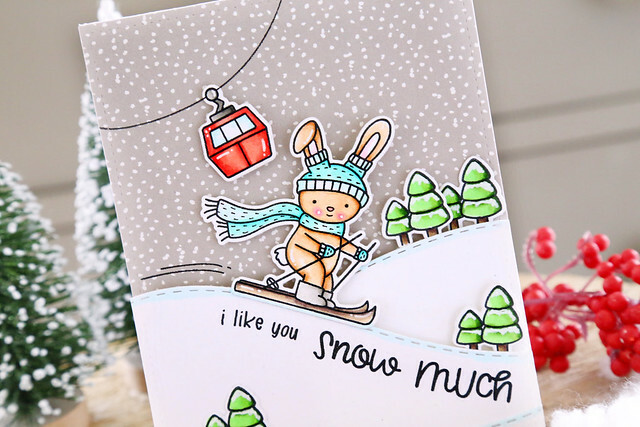 I used the dotted line from the set to hang snowflakes and then created falling snow by way of a white gel pen. This is an upscale production, obviously. They had a budget for falling snow. ha. 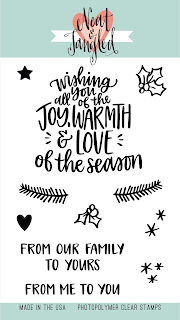 Having been to my share of Christmas pageants, I would have to say that a few players are missing: the kids picking his nose, and the girl who keeps lifting up her skirt. The hotter the mess, the better the production, amirite? I hope you like these little cuties! 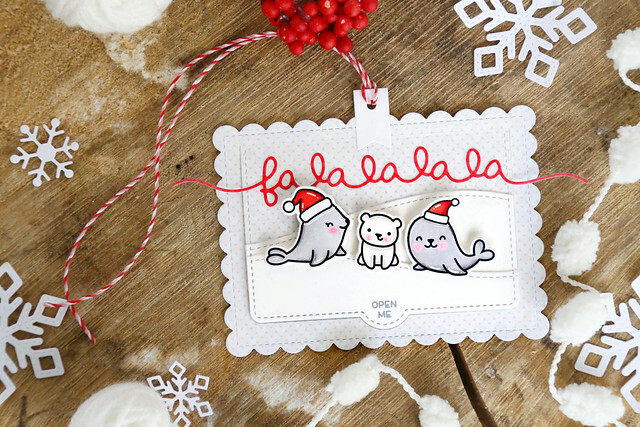 I love them all lined up, but wouldn't they be perfect on their own, on Christmas tags? Let me know what you think before you hop over to the NT blog this morning - click! I paired it the bear from Holiday Baking and the snowglobe from Elfs and Their Shelf. 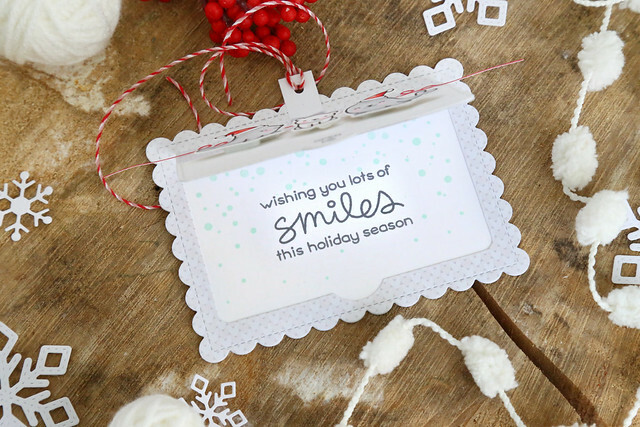 The biggest greeting was heat-embossed onto a sheet of Buffalo Check patterned paper. Honestly, can we just have one paper manufacturer make a whole pad of these? In black and white, and red and black? That would be awesome. The bear comes holding a mixing bowl, but I made an adjustment so that he could hold the snowglobe. I stamped the bear again onto another scrap piece of white cardstock, and trimmed out the paw at the forefront. The snowglobe is a big enough image that could cover the mixing bowl, and you hardly notice the seam of the extra paw I stuck on. Not hard, and a great way to stretch my stamps! I finished off by framing the piece with a dashed-line border using a white gel pen. I like the pop that it gives! I hope you like it! There's more to check out on the NT blog this morning - click! 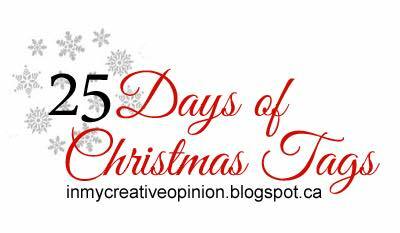 Before you go, don't forget to leave a comment to be eligible for a 25$ gift card, drawn at the end of the week from comments left on all of the participating blogs.